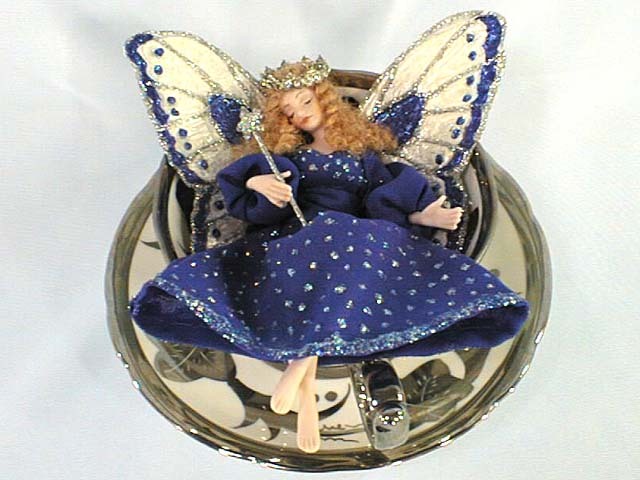 Fairy Princess Sapphire naps in her lovely silver lustre teacup and saucer. She is attired in a lovely blue "sapphire" silky gown with hand applied glitter dots. She wears her fairy crown and holds her star wand even as she sleeps. She wears lace-banded pantaloons under her dress. Her teacup is a collectible Norcrest of Japan bone white with silver overlay cup and saucer, with the mark 3/2885 on the bottom of the cup. 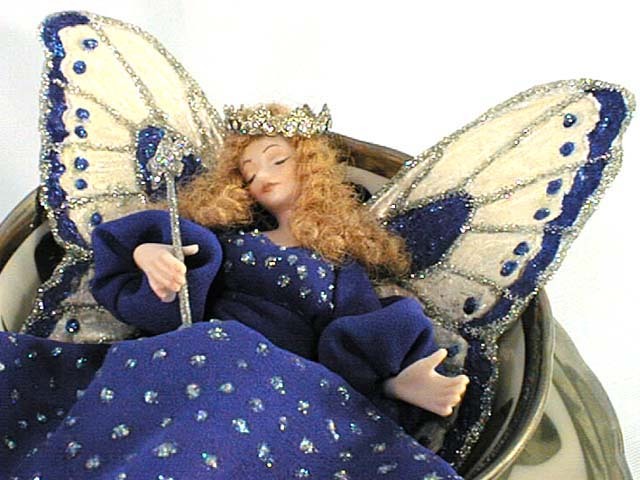 Her hair is a beautiful red, and her wings are handmade and hand painted. As you can see from the closeup picture below, she is quite a sleeping beauty! She is about 41/2" tall and has a wingspan of 41/2". Her teacup saucer is about 6" in diameter and the cup stands about 21/4" high. She is a breathtaking, one of a kind work of art by the artist JoAnnJ of Galleria d'Juliani, and is hand signed by the artist.